The City of North Vancouver is on their journey to sustainability using a 100 Year Sustainability Vision for a zero carbon future. With the help of the Fraser Basin Council they took time to reflect on their sustainability strategies. 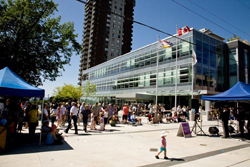 The City of North Vancouver (CNV) is a community that is well known throughout Canada for their exceptional sustainability planning efforts. They are integrating sustainability into almost every aspect of their economic, environmental and social fabric. The roots of sustainability for the CNV can be traced back to the 1990s. They were one of the first municipalities in Canada to develop a strong social plan and to put in place meaningful environmental protection measures. 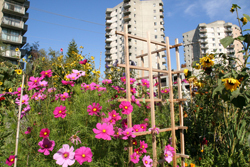 The City’s first Official Community Plan (OCP), created in 2002, systematically integrated sustainability concepts. For the implementation of this progressive plan they won the inaugural Green City Award from the province in 2007. Today the city is implementing a new plan – a sustainability vision that aims to guide the City toward carbon-neutral status by 2107, the City’s 200th anniversary. The CNV presently has a dense urban core that is both pedestrian friendly and well serviced by transit, a healthy jobs-to-resident ratio, and progressive approaches to both energy generation and conservation. As part of the City’s desire to find new ways to improve their sustainability practices they brought in the Fraser Basin Council (FBC). Staff from the Smart Planning for Communities program, and Greater Vancouver Sea to Sky Region provided the City with an objective assessment of their policies, plans and programs from a sustainability perspective. The assessment was accompanied by a set of ideas for enhancing CNV’s performance in the future to keep them moving in the right direction. 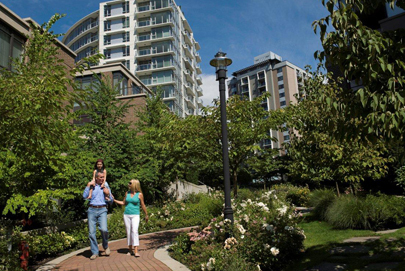 Holistic long range visioning is one approach that sets North Vancouver apart. Implementation of the City’s vision is being led by passionate project leaders in several of the City Departments such as Finance, IT, Community Development, Facilities, Engineering, and Human Resources. Suzanne Smith and her colleagues in the Community Development Department are working on plans that will take decades to fully implement. It is important to her to make sure these plans are ‘living documents’ that are synchronized for implementation throughout the municipal structure. Implementation can be complex. "Sometimes it’s hard to see the big picture, especially when you have a big staff like CNV does," Smith explains. "Only an outside party can see their work from a ‘bird’s eye view’ which allows us to pin point gaps and deficiencies that they might not be able to see themselves." the effects or impacts the implementation of those documents have across the broader community. The first step involved a review many of CNV’s key policy and guidance documents that represent their expressed commitments, through a sustainability lens. The Smart Planning team reviewed over sixty of the City’s most commonly used documents against the BC Ministry of Community Services Smart Planning Community Assessment Template. During the review the team discovered seven additional sustainability categories being addressed by CNV for a total of 24 theme areas. The next phase involved interviews with a range of CNV staff members. In total 13 staff from eight departments, at varying seniority levels were interviewed in order to gauge their use of CNV’s guiding documents. The FBC team, administered a second similar City staff-wide survey in order to help gauge how well the concept of sustainability was understood, how it was incorporated into the work of city staff and to identify barriers to implementation. Suzanne Smith stated that the survey was very useful to the city as they now have insight into where their level of corporate awareness is on the topic, which is very valuable to them as "no single person leads the sustainability initiatives at the city…so everyone from the top to the bottom needs to know what it means and how to implement it." The Smart Planning team also reviewed external indicators of sustainability, spanning the economic, social, cultural and environmental realms, in order to help scope complex issues and build understanding by reflecting trends over time. This provided the City with actual measures of their overall health. 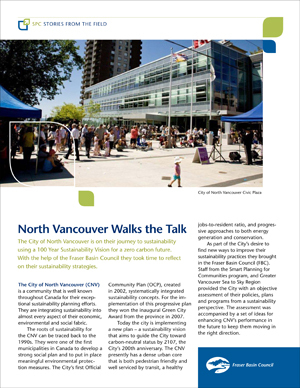 The summary of findings was organized in an assessment document prepared by FBC entitled, Measuring and Communicating Sustainability Progress Within the City of North Vancouver. The assessment found that CNV was well into their sustainability journey with several success factors in place. It also identified some opportunities for the City to strengthen its work. The review revealed an opportunity to enhance the City’s work by helping people move from balancing aspects of sustainability to integration. Overall, the survey found that the City was doing an exceptional job with respect to fostering the staff’s awareness, pride, passion and commitment to sustainability initiatives. The assessment revealed a few untapped opportunities for integrating sustainability such as; valuing natural assets, cross-appointing advisory committee members, and further reporting mechanisms. The FBC team encouraged further cross-pollination & networking amongst committees; strengthening ties and encouraging increased dialogue with the First Nations groups in the region. The City had always kept track of their capital assets, i.e. infrastructure, but had not ventured towards the newer concept of tracking their natural ones. "For example, assets like the urban forest, un-compacted soils, a marine shoreline, they all perform services for the community." noted Angela Evans. As a consequence CNV is now looking into starting a Natural Asset Database, also known as eco-budgeting, to assign value to their ecological services. CNV will act on the recommendation for more rigorous reporting of their Targets, Indicators and Monitoring System (TIMS). TIMS which was developed to help track the city’s progress in achieving its 2002 OCP vision. The vision was; to be a vibrant, diverse and highly livable community that strives to balance the social, economic and environmental needs of our community locally. 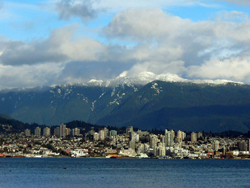 As leaders in sustainability, the City of North Vancouver was not only willing to experiment with a third party assessment of their work, but have taken the findings to heart and are continuing to make constant improvements and strive for excellence. FBC’s Marion Town explained, "it showed that the decision makers were doing a great job, that the staff was doing a great job, that politicians were thus making good decisions… it is very important to be able to celebrate successes and use them as a means to get better." Contact us for advice on your sustainability planning project.